Today we made tomato and sweet pepper quiche in the Solar Hot Pot for lunch (yum! ); gave the Hot Pot a quick wash, and now the fondue will go in. 12:45 pm—preheat Solar Hot Pot by setting up facing the sun (with lid on). 1:00 pm—12 oz. 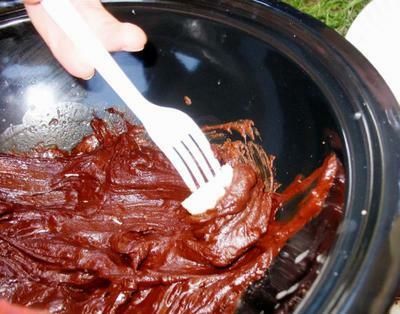 chocolate chips, 1/4 c. cream, 1 t butter, 1 t. vanilla or almond extract: put in Hot Pot, cover, set timer for 15 minutes. 1:15 pm—stir thoroughly. Cover, set timer for 15 minutes. 1:30—stir. If it looks like it could use some more time to be really warm, cover and check every 5 minutes or so. This turned out fantastic—warm and fudgy!! One of the kids gave it “10 stars” out of 5. 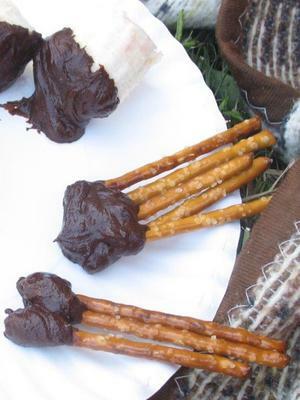 LOL Even with the lid off to dip fruit & pretzels, the chocolate stayed warm—almost TOO hot! 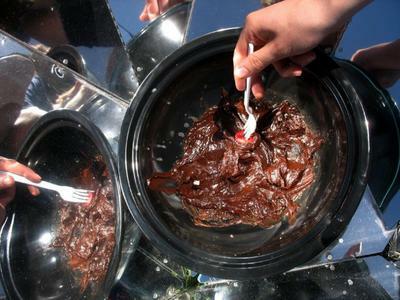 At the end, we took the Pot out of the reflective panels and set the Pot in the grass, and still the chocolate stayed warm.